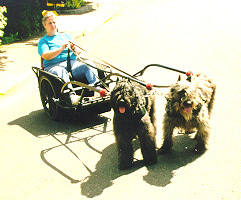 Below are a pictures of Sue being pulled in the cart designed and built by Robert Graham of the Graham Carriage Works. Another picture of Sam and Mona pulling Sue. Notice that the shafts are above the dogs. 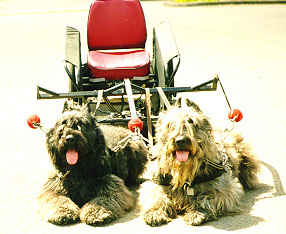 They don't actually place any weight on their backs when the seat is positioned to provide proper balance. This is Sam and Mona in the down position. 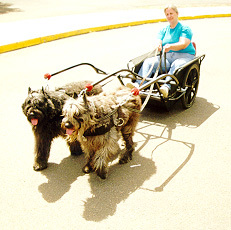 This is how you place the dogs when you get in and out of the cart so as not to place any weight on their backs. Notice the happy looks on their faces. They aren't just smiling for the camera. 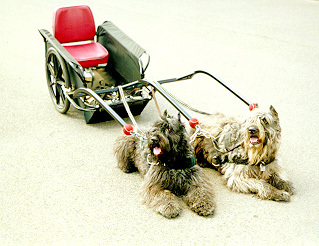 These dogs love to work, and to them, pulling the cart is a lot of fun. This is the start of a turn. Here they are making a right hand turn. Notice how much flexibility they have with this style of shafts. Because of the design, the dogs can turn under the shafts to make some very small radius turns. Sue, Mona and Sam, going happily down the road. 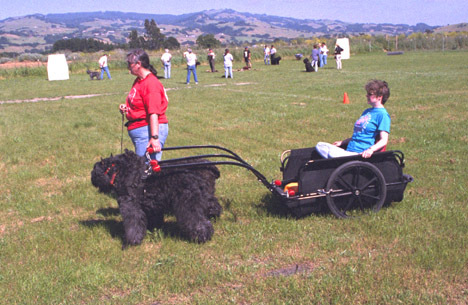 Here Sue is getting ready to give a talk and demonstration on carts at the Pacific Gateway Working Bouvier Club Trial in Santa Rosa, CA. Amy Boggs was good enough to ride in the cart and provide a little weight for balance. 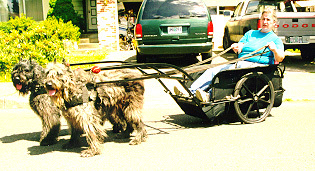 Many breeds besides Bouviers love to cart. 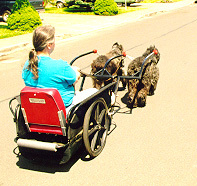 If you think you and your dog would enjoy carting, drop Sue some Email at Sue Matthews and find out more.